The world of lawn mowers is filled with machines that can take your garden trimming experience to a whole new level. And the Ferris zero turn mowers have of late caught my fancy. Ferris is a name which comes up quite frequently whenever you go looking for lawnmowers, and it’s popular for a reason. All the Ferris lawn mowers I’ve tried out have been pretty up-to-the-mark, despite their minor shortcomings. And today I’ll be taking you through some of the fantastic features of the Ferris mowers and why they have grown to be one of my personal favorites. Ferris 400S Reviews 2019: Why can it be your pick for the day? What about the Ferris Zero Turn F400S that could have been better? Ferris IS600Z Reviews 2019: What did I like the most about it? When I tried out the F400S at a garden of an old age home recently, I was pleasantly surprised as to how efficiently and quickly I was able to finish the project. There were a few distinctive differences that I noticed about it which sets it apart from the rest of the competition. When it comes to speed and toughness among lawn mowers, not many models are able to ideally represent the best of both worlds. However, the Ferris Zero Turn F400S is one such gardening tool that is as compact as it is fast and easy to navigate. The mower comes with an entry-level body which is able to effortlessly maneuver around tight areas without sacrificing much on its other features and attributes; the mower remains commercial grade through and through. It has an above average fuel capacity for longer trimming jobs, and with thicker tires, it provides better traction on both dry and wet terrain. It even has a dual drive system which makes every lawn trimming job feel like a breeze along with making them a very fun experience. I don’t think the name Briggs and Stratton needs any introduction when it comes to the field of lawn mowing. Any fellow gardening tool enthusiast worth his/her salt will be able to tell you how absolutely amazing a Briggs and Stratton engine is. These engine models are one of the most powerful in the market, and the F400S comes equipped with one that has the ultimate debris management. So, not only will this allow the mower to go over bumpy terrain effortlessly but along with the improved dust and particle filtration system, it will help the machine to last for years to come. Additionally, the F400S is provided with a patented suspension system as well. It has an independent rear coil-over shocks which make going over uneven ground even less of a hassle. 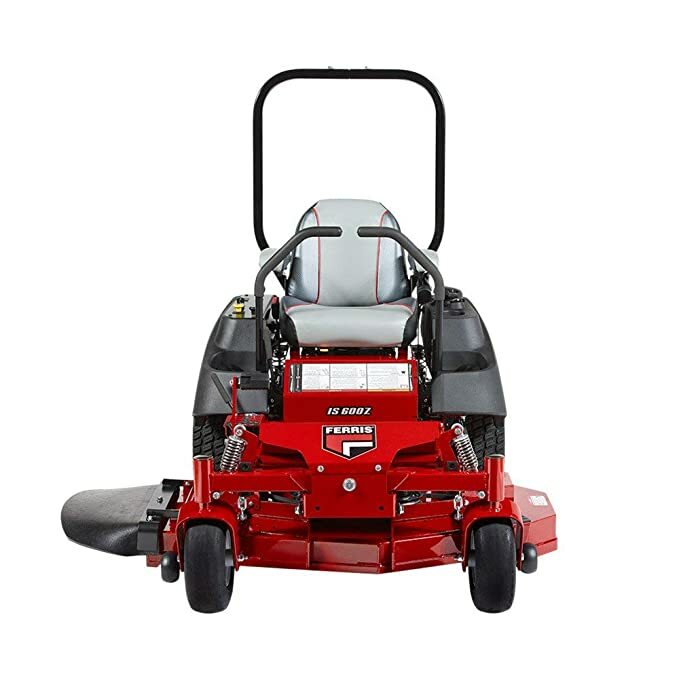 Unlike most of its competitors, the Ferris F400S mower is designed with a lot of user comfort in mind. 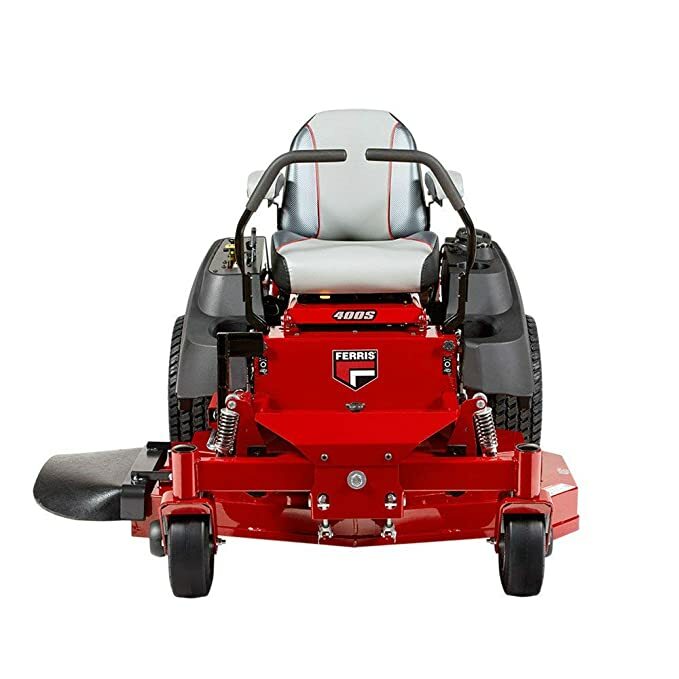 If you flank the operator seat, you’ll notice that the mower has a conveniently integrated cup holder along with an easy to read fuel gauge for the 5.5-gallon tank. 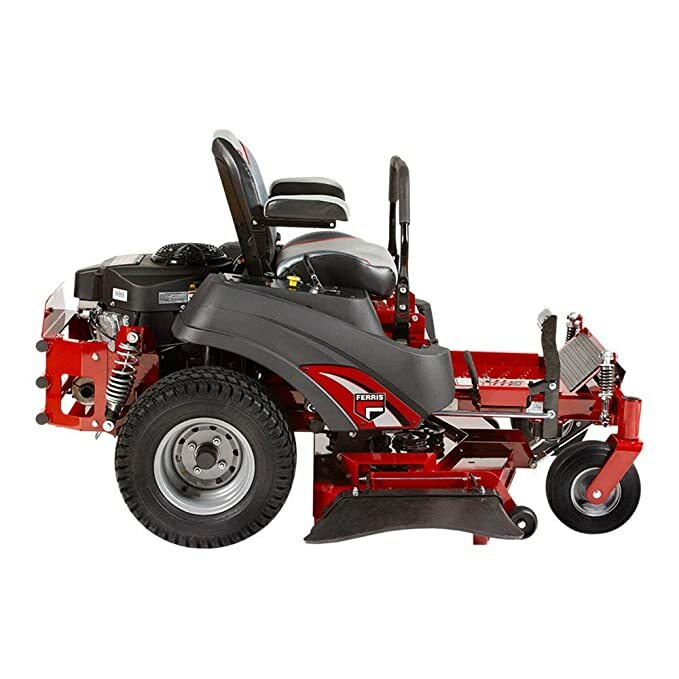 Moreover, it even houses a fabricated bumper that protects the mower’s engine, thereby reducing periodic maintenance costs and allowing easy access for services. The bumper also acts as an attachment point for baggers and tow systems which will help you load on your extra accessories without much problem. 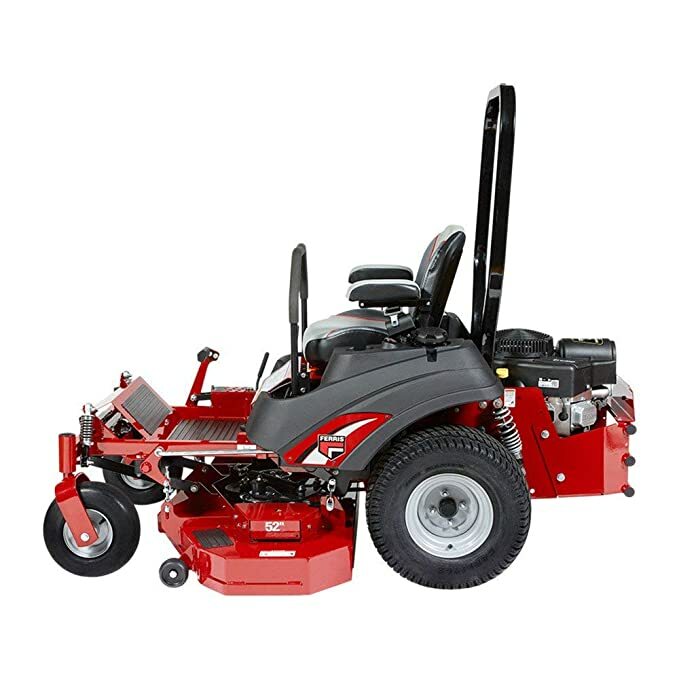 For faster grass cutting capabilities, Ferris is designed with a dual Hydro-gear ZT-2800 transaxles to deliver a movement speed of up to 8 mph. This is quite fast for a lawn mower of its class. It also has an external oil filter that allows easier maintenance, and you’ll be able to clean out the machine quite easily. 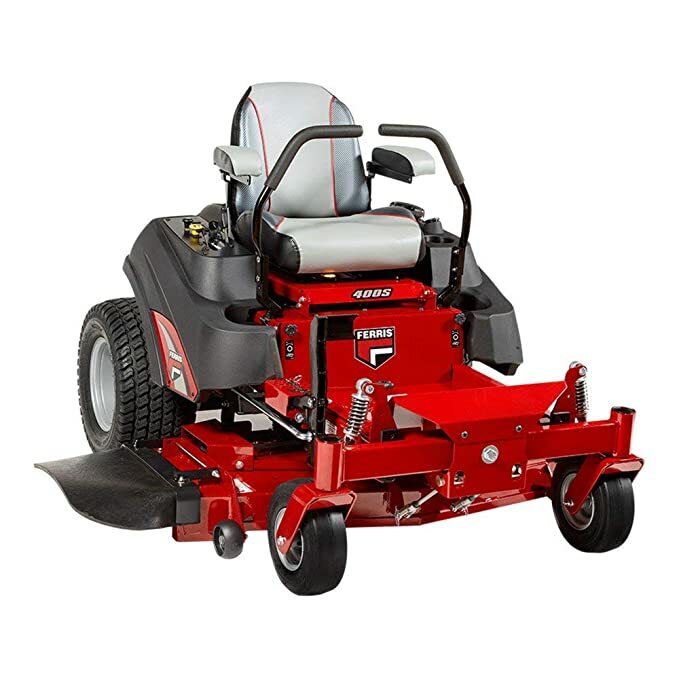 To start with, even though the mower’s suspension system allows it to go over uneven surfaces rather easily, it does nothing for the on-deck vibrations. The seat vibrates a lot when the mower is in use, but then again it’s only during the higher cutting speeds, not the lower ones. Secondly, the Ferris doesn’t work all that well on inclined slopes. It does really well on lower inclinations but starts to slow down significantly as the angle increases. 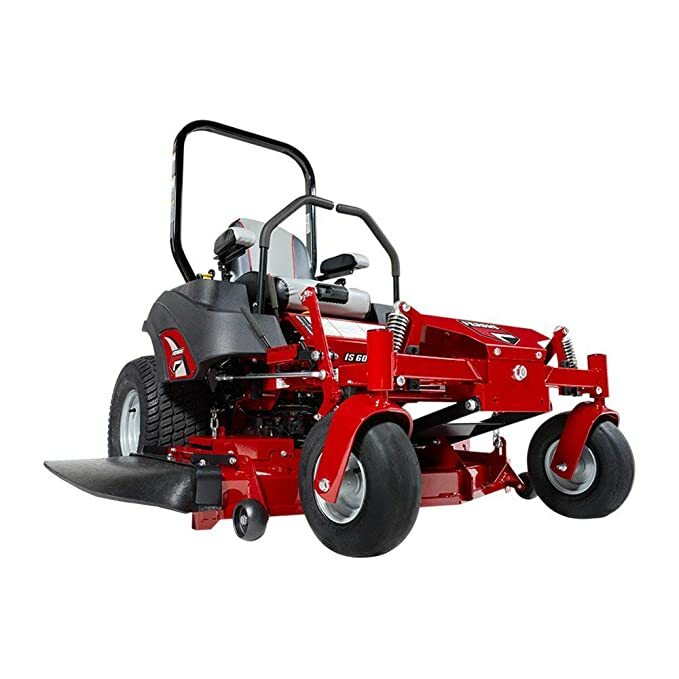 Is the Ferris F400S a commercial mower? Yes and no. The F400S may have a lot of commercial grade parts built into its design, but it’s a semi-commercial mowing machine at best. It’s ideal for domestic use and smaller professional jobs especially for mid-sized fields. Can I attach a mulching bag to the mower? Yes! The fabricated bumper of the mower has attachment slots designed into it which will allow you to hook up accessories like mulching bags and other towable devices. Does Ferris provide free shipping for the mower? Yes, they do, but that is only at a 30-mile radius from their location. Anything beyond and you will have to pay for all the shipping charges. Ferris IS600Z is a commercial grade zero turn mower and is equipped with a Kawasaki FS600V engine. The engine has a power of 18.5 HP and a total displacement of 603 cc. This dual-cylinder engine has an electric start and can be started just by turning a key. The fuel tank that powers this engine can store up to 5.5 gallons of fuel, which is a lot by any standard. You need this large amount of fuel because it lets the lawn mower go up to a maximum speed of 10 mph forward and 5 mph in reverse. The mowing deck is huge at 52 inches and is made out of 10-gauge fabricated steel. This huge size coupled with the speed of the lawnmower makes it exceptionally efficient, and it can mow large areas of the lawn in a short time. The blades can mow up to 4 acres per hour based on 80% efficiency. The mowing deck is foot operated, and you can use it to set the cutting height exactly where you want. You can lift the blades anywhere from 1.5 to 4.5 inches in 0.25-inch increments. The blades engage electrically, which means you don’t need to do it manually. The floor pan can be removed easily, so you can easily access the top of the deck. I really like how this simple feature makes the lawnmower so easy to maintain and keep clean. This product comes with a patented suspension system that consists of rear coil-over shocks over the front axle, which make for a very smooth ride. The seat is comfortable and even has a seatbelt and roll-over protection to protect the lawnmower from rolling over. But you probably won’t have to worry about that because if you’re going too fast, there’s a transaxle brake to stop the lawnmower from moving. The control panel is very ergonomically made complete with a fuel gauge so you can judge when the fuel is running out. The controls themselves have pillow block bearings so that they stay protected from the elements. The panel even has a cup holder, a feature which I’m particularly interested in. Ferris makes no compromises when it comes to durability, and if you’re paying so much money for a lawnmower, you would want it to last a good few years. Fortunately, Ferris IS600Z is built like a beast. The spindles are made out of cast aluminum, and the mowing deck itself is built out of 10 gauge fabricated steel. A heavy duty bumper protects the engine from accidents. Although the maximum speed is a huge 10 mph, the engine itself does not pack much of a punch. The acceleration is a little shoddy, and it does tend to jam up if you try to pass it over rocks or the like. The steering can be difficult for a beginner. It might take you some time to get used to the zero turn nature of the lawnmower. Until then you might make some mistakes, so drive slow and ensure you’ve always got one hand on the brake. How fast can this lawnmower go? This lawnmower can go up to a maximum of 10 mph. What grade is this lawnmower? It’s rated as a commercial grade lawnmower. Does this seat come with an armrest? Yes, this seat comes equipped with an integrated armrest. It has a 3-year engine warranty, and the product has a 4-year limited warranty (48 months or 500 hours), whichever occurs first. Coil-over-shocks and other suspension related components are covered for 4 years. Does the engine have special cooling mechanisms? No, it is an air cooling engine, and it does not have any particular systems. Lawnmowers today come in various shapes and sizes, each boasting a unique pair of features and different cutting capabilities. However, the Ferris mowers are some of the very few versatile machines that have an all-around grass trimming potential, and I hope they can turn out to be your mower of choice as well.